Pros: The majority of the material in the book is accurate. Cons: The problems with this book are comparatively modest compared to its significant value as a resource for hot rodders with older cars looking to dump old Small-Blocks and even some Big-Blocks for more powerful and much lighter Gen 3s and Gen 4s. "Restorod." Of late, amongst automotive enthusiasts, the term describes an older car fitted with a late model powertrain. The most popular late model engines to put in older hot rods or muslecars are GM's Generation 3 or 4 Small-Block V8s which are known to hot rodders as LS-series or LSx engines and have been the stock Corvette engines since 1997. The swapping of Gen 3/4 V8s in to older cars has become so popular that a cottage industry has sprung-up selling adapters, oil pans, engine mounts, headers and other parts necessary to put LS-series motors into old Novas, Camaros, Chevelles, C4 Vettes and even more unusual endeavors such as Buicks, BMW E36es and Jaguar XJSes. With the level of enthusiasm as high as it is, it was inevitable that someone would write a book about transplanting Gen 3s and 4s into other cars. 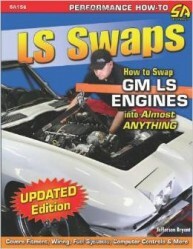 It was CarTech books, already the publisher with the best line of LS-series books on the market, which responded with How to Swap GM LS-Series Engines into Almost Anything. Author, Jefferson Bryant, covers a wide-range of engine swapping subjects of concern to anyone putting a Gen 3/4 into an older car. A few of the key topics are oil pans, engine mounts, wiring harnesses and cooling systems. A very useful addition to the book are several sidebar articles about specific engine swap projects but while they're a nice feature, there's not enough of them and, worse, there are none about putting LS motors into old Corvettes. The majority of the material in the book is accurate. No doubt this is because of the Author's experience as a long-time automotive tech writer, however, there is a sprinkling of questionably-researched statements in the book. Examples are Bryant's claim that the Gen 3/4 engines are the first time GM manufactured an aluminum block, that the Gen 2 V8s (LT1/LT4) were poor performers and a blanket statement that GM's Dexcool antifreeze causes cooling systems to "sludge-up". All of those are incorrect. The other slight problem with How to Swap GM LS-Series Engines is CarTech's limited editing. I think, had this book seen a stronger intervention by someone editing for length, some "wordiness" could have been eliminated making more space for sidebars on specific LSx swaps. That said, the problems with this book are comparatively modest compared to its significant value as a resource for hot rodders with older cars looking to dump old Small-Blocks and even some Big-Blocks for more powerful and much lighter Gen 3s and Gen 4s. So, if you're thinking about stuffing an LS9 into that tired '80 California 5-liter car, read this book.